You'll find every Las Vegas loft, condo and high-rise currently available for sale on this site with pictures, pricing and more. Search all Las Vegas condo buildings and see what's available in each. Filter by neighborhood, building type and more. Bill Zinsser is a Las Vegas high-rise specialist. Contact Bill for expert representation. "Bill helped me twice in last 4 years. Once buying and another selling. Turnberry Towers: Located on 10-acre grounds, Turnberry has a nice fenced-in dog park. Panorama Towers: Panorama allows two dogs up to 80 pounds and has access to a nearby dog run. One Las Vegas: This building has large open spaces with easy access to the dog park. Sky Las Vegas: Located right on the strip, Sky Las Vegas features a dog run and pool. If you're looking for high-rise condos for sale in Las Vegas, NV, contact us and let us know about your needs so we can help you find the top Vegas condos for your lifestyle. 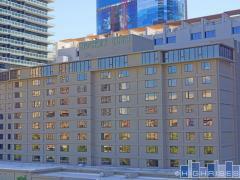 At Highrises.com, we're experts in helping people to find high-rise condos. Las Vegas condo specialists are here to help, ready to arrange a tour of one of our featured properties. Let us make it easier to buy condos in Las Vegas with the amenities you need: Contact us at 702-583-4049 today to get started.